Update: Latest version is here. PSNee is an open source PSX modchip code for Atmel AVR microprocessors like the ATTiny and ATmega (Arduino boards). It was coded by "THE FRIENDLY FRIETMAN" and released on the assemblergames.com forums a while back. Right now, assemblergames is down and PSNee is not yet finished. From what I can tell, it is missing stealth functionality and it does not gate the original SCEX string for original discs on consoles newer than the 550x series. Stealth is somewhat implemented by a timeout. But modchip protected games work by asking for the SCEX string at an arbitrary time after the game has booted. A proper stealth mechanism will provide the string only when the drive controller put the laser on sector 4 of the disc. It must not send it when reading sectors where an original would not have the string. Gating on older consoles should work (but I have not tested it yet). On newer consoles, I don't know which point to solder a gate signal to, and how the gating should be implemented. I do know that the old "link wire" method will work though. //                     PPPPPPPPPPPP  P            P  PPPPPPPPPPP  PPPPPPPPPPP   VERSION 6! //all platforms supported by Arduino, preferably ATTiny. Finally something modern! //Look for the "Arduino selection!" section and verify the target platform. Hook up your target device and hit Upload! //Look at the pinout for your device and hook PsNee up to the points on your Playstation. //be reproduced by an ordinary PC CD burner. //little pits and ehm... little not-pits are embedded that represent the data stored on the disc. //reliably read the data off the disc. //intensity measurement, difference measurements, servo. There. //recognisable signal, as the laser needs to be corrected to follow the track optimally. //of Europe) or SCEI (Sony Computer Entertainment of Japan), depending on the region of the disc inserted. //The security thus functions not only as copy protection, but also as region protection. //again, to enable playing multi-disc games. This is also called a stealth modchip in marketing-speak. //               New in this version! //   make sure PsNee works just as well. //None, just like it should be! //     Setup function - execution starts here! Last edited by rama3 on July 2nd, 2017, 7:44 pm, edited 1 time in total. We know that the SCEX string can only be found on the earliest sectors on the CD. The read head has to be at almost the innermost position for reading it. There's a small pin on the read head that signals when it reached the innermost position. One simple method to implement stealth is then to put a little bit of tape on the tray, so that the detector triggers even when the read head is at about the position to read sector 4 on the disc. Then we just watch that signal on the Arduino, kill all timing related injections and replace them with injections only when the signal says so. I have tried this method and it does not interfere with normal operation. It allows Dino Crisis (which is modchip protected) to boot. It is very simple and effective: It doesn't even require timing anymore. We simply send the SCEX string whenever the read head is on the innermost position, just like it would happen on real disks. The only problem with this that I can think of: Some games might deliberately put the read head to that position, but then not actually read the data there. My method would send the SCEX string and the game would know about the modchip. Unfortunately, I don't know if any games used such a method. As an old readme from the 90s said, the game is a deliberate attack on (then) stealth modchips (that used a signal to detect the pad init function, normally triggered when the game exe loaded). To pass the check, it has to get the first string, but not the second. It will fail if it gets 2 strings, or if it gets no string. Which sector 4, counted from where? From 00:02:00 or 00:00:00 or from begin of TOC? The SCEx signal is transferred at 250bits/second, so four characters with 11bit each would take around 1/5 seconds for transferring the SCEx string - so storing the whole string on a single sector isn't be possible. From what I know the SCEx string is believed to be stored in the "wobble" signal somewhere at the "begin" of the disc (=presumably in the TOC area). I don't remember Dino Crisis doind anything special about (re-)reading the SCEx string, except maybe verifying that it cannot read the SCEx string from higher track numbers. 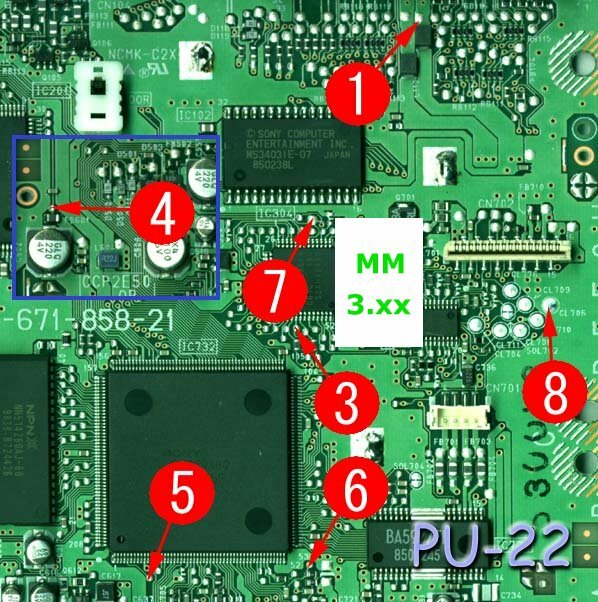 But if it's reading the string - from the TOC area: The PSX doesn't allow to seek into the TOC area (via SetLoc), so that it could be done only via something like Reset/Init/SetSession commands, which should be using the POS0 sensor to find the TOC (and the SCEx area), so the modchip could simply use the POS0 pin as is. Without needing to put tape on the POS0 sensor (doing that wouldn't work to well anyways, if you tweak it to trigger on 00:02:04, then the drive couldn't read the TOC any longer (which is located at "negative" MM:SS:FF addresses, prior to 00:00:00)). Nocash, it could be some other *very early* sector as well. But I remember reading somewhere that the wobble starts at sector 4. It is indeed close enough to the POS0 sensor that it sometimes triggers it without any tape added. But it's not reliably doing it. I've verified that adding the tape makes it reliable and doesn't cause issues seeking to early sectors on bootup (I guess Sony left some slack in this, to account for manufacturing differences). So another thing that'd be cool if it could be done: Capture the drive commands and just look for the one that reads the SCEX string. Timing injections to that would take all "heuristics" out of the way. rama3 wrote: I remember reading somewhere that the wobble starts at sector 4. I am not absolutely sure where SCEX/wobble starts. I was always thinking that it starts at the begin of the TOC (or even shortly before the TOC), as far as I remember, the TOC is about 3-4 minutes long, ie. it would start at sector -15000 or so. I guess that somebody just confused the 4-byte "SCEX string" with the "Licence string" on sector 4. Hmmmm, I wonder what is happening there. POS0 should trigger somewhere at sector -15000, which would be miles away from the normal ISO sectors (ie. sectors that are seekable without using the POS0 switch). How thick is your tape? Several miles? Another theory would be that the game is seeking to POS0, but your hardware setup might miss the POS0 signal (maybe because it's too short, or because the switch contacts are a bit dirty and don't reach a clean 0 volt level). And the tape might change the mechanical behaviour to produce a better/longer POS0 signal. Though concerning timing, the PSX must first poll the POS0 signal, then stop the sled motor, and then start TOC reading with sled getting moved in opposite direction - so the POS0 signal should be long enough for getting sensed by modchips. rama3 wrote: So another thing that'd be cool if it could be done: Capture the drive commands and just look for the one that reads the SCEX string. Timing injections to that would take all "heuristics" out of the way. The TTY Debug Mesage Window in no$psx includes options for logging CDROM commands (and IRQs), maybe that could be useful. Apropos, Dino Crisis, are there already any modchips that can play that game? And if yes, do they connect to POS0 or DOOR or the like? Oh, and is the game working in no$psx? I've just noticed that no$psx still leaves the 19h,04h and 19h,05h test commands unemulated, as far as I remember Dino Crisis does use that test commands - if it's working even without emulating that commands then the proctection doesn't seem to be very strict. I thought the wobble is where the ATIP would usually be. Since the discs are pressed, that data segment is useless on pressed discs (it's only relevant to have on CD-R's) so Sony pressed the wobble in this area for PlayStation games. To read the SCEx counter, you have to seek to somewhere in the data area of the disc, start CD play mode, reset the protection counter (send commands 0x19, 0x04 to the HC05), wait, and read the results (send commands 0x19, 0x05). You have to make sure the drive isn't in the Lead-In/TOC area though or you will pick up protection symbols even if there is no modchip. Nocash, I hooked up my scope to the POS0 readout (and everything else as well. It really is nice to see what exactly is going on ). When the protection routine in Dino kicks in, it first moves the read head to the SCEX area. The scope sometimes shows a blip (POS0 activated), and sometimes it doesn't. It probably depends on the momentum the sled had this particular run. The game reads data for a second, then moves the read head forward a bit and reads data again. If it got what it wanted, it continues. Otherwise it will spit out an error screen and stop. I agree that the protection isn't very strong, but this is only the first NTSC-U release with it. Other games might be better. As far as I know, there is no comprehensive list of protection schemes used in games. EDIT: Okay, unless there's a bug in our code, Dino Crisis actually works with SCEE, SCEA or SCEI. It fails if it does not match any of these things. I haven't tried SCEW yet though, but I doubt they added that. I think only the Yaroze's had that in their HC05 and the wobble contained SCEW itself on pressed Yaroze CD-ROM's (such as the "Net Yaroze Boot Disc" (DTL-H3000)). We could really use a small list of games with known anti-modchip checks and how they do it. rama3 wrote: We could really use a small list of games with known anti-modchip checks and how they do it. Yeah that would be very useful but I don't know any of them except for now Dino Crisis. Vandal Hearts 2 NTSC-U: unknown if antimod, but stops on white Konami screen if (guessing) the BIOS region doesn't match the game's. It only works on my NTSC-U BIOS machines. Last edited by rama3 on May 8th, 2017, 8:23 am, edited 1 time in total. Could it be that NTSC-U games on a PAL / EU BIOS skip over the antimod protection routines? I'm having trouble getting the protection screen on nearly all NTSC-U games. Updated my findings on Vandal Hearts 2. Here's my work in progress. It uses the position 0 switch on the laser assembly. To make this work, a bit of sticky tape is required, so that the switch closes even when the read head is a little further out. I use 2 layers of electrical isolation tape. Tested on an NTSC-J PU-18, using an Arduino Uno. //Branched and tweaked for use with the Position 0 switch on a PSX laser. //This allows deterministic SCEX injections, without relying on timing. Also gets rid of connection wires for LID and RESET. // Arduino docs say all INPUT pins are high impedence by default. Let's be explicit! // Read head is in wobble area. Inject SCEX. // loop_counter is a tweak point. It depends on how good the contact to the POS0 switch is. Know if anyone has that code? It'd be good to use in PSIO to detect anti-mod titles when images are converted so single-bin images.